Autophagy represent a conserved pathway fundamental in the regulation of intracellular homeostasis. It relies on the delivery of cytoplasmic contents to the lysosome for degradation. Among these cargo material destined to be degraded there are aggregate-prone proteins causing severe neurodegenerative conditions. For that reason, Autophagy has been recently proposed not only as a key regulator of physiological processes, but also as a fundamental pathway which might be responsible for the pathogenetic mechanisms of several neurological disorders. 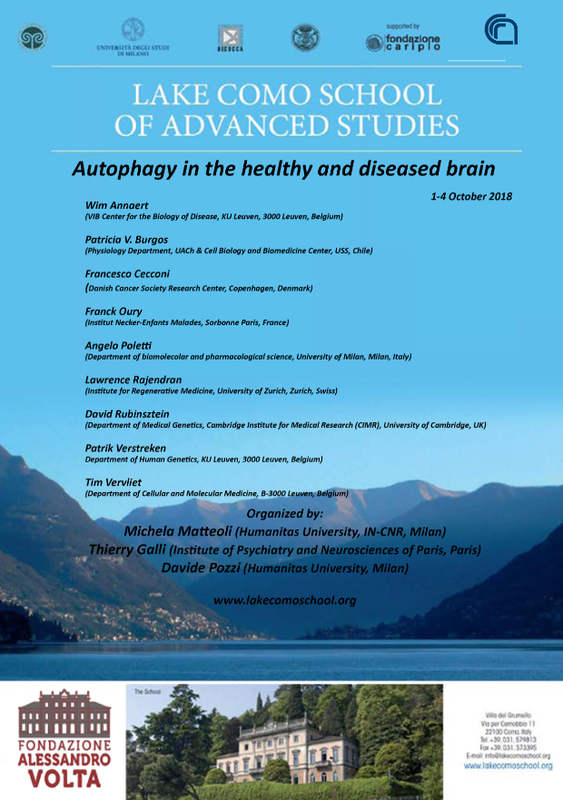 The aim of the School of Neuroscience will be to overview the recent advances in this new emerging field, thus describing the molecular underpinnings of autophagy and its involvement in pathological conditions. © 2019 Autophagy in the healthy and diseased brain.